Product #3612 | SKU FS1 | 0.0 (no ratings yet) Thanks for your rating! 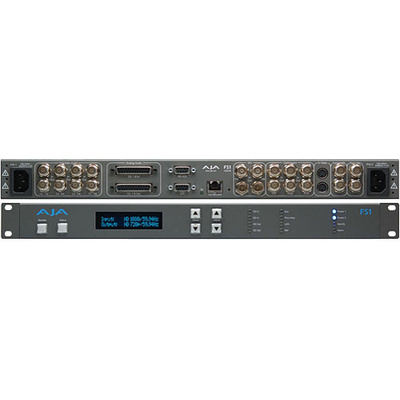 Featuring a flexible "anything in, anything out" architecture, the FS1 Universal HD/SD Audio/Video Frame Synchronizer and Converter can simultaneously work with both HD and SD video - all in full 10-bit broadcast quality video and 24-bit audio. The FS1 supports virtually any input or output, analog or digital, HD or SD. The FS1 can up-or down-convert between SD and HD, and provide simultaneous HD and SD outputs. Up, Down, Cross-Conversion between HD formats are also supported, with simultaneous output of both formats. For audio, the FS1 supports 8-channel AES, balanced analog, or embedded audio with full flexibility and audio processing controls. The FS1 supports closed captioning and the conversion of closed captioning between SD and HD formats-including full conversion of CEA-608 captions to the CEA-708 standard. The FS1 is also network ready, supporting web-based and SNMP remote control.